Of all the dreary, disheartening errands, a trip to Boston City Hall has a special brand of bleakness, right up there with a visit to the Registry of Motor Vehicles or a car inspection. But now residents will be able to conduct their municipal affairs without trekking to Government Center, due to a ­mobile outreach program that will bring City Hall to the neighborhoods. 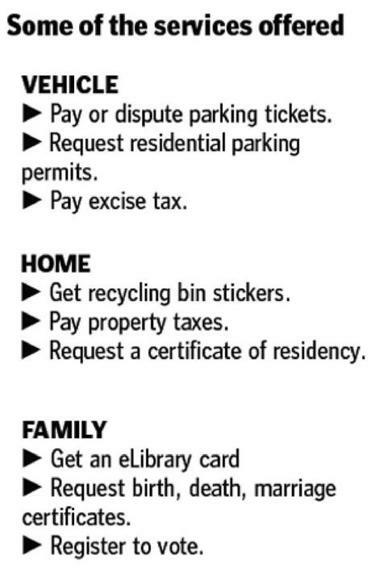 Starting Wednesday, residents can pay parking tickets and tax bills, get a library card and dog license, even register to vote, at a van dubbed “City Hall To Go.” A newly refurbished bomb squad van, the vehicle was made to resemble a food truck, but is essentially a rolling office, outfitted with laptop computers, wireless access, and the necessary paperwork from a host of city departments. City officials say the program is the first of its kind nationally, and they hope it proves a convenient alternative for residents who do not use the Internet or rarely get downtown. 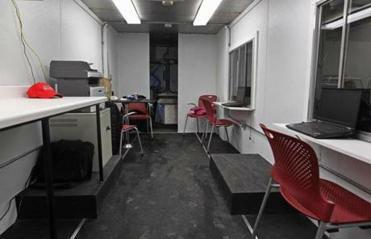 The interior of the City Hall To Go truck has laptop computers and wireless Internet access. Staff in the mayor’s office say the rolling City Hall provides “one-stop shopping, where residents can take care of several tasks at once.” Workers can provide information from school registration forms and summer camp guides for parents to tax exemption forms for the elderly. “It’s another way of connecting with the community,” said Katharine Lusk, a program ­organizer who works in Mayor Thomas M. Menino’s office. 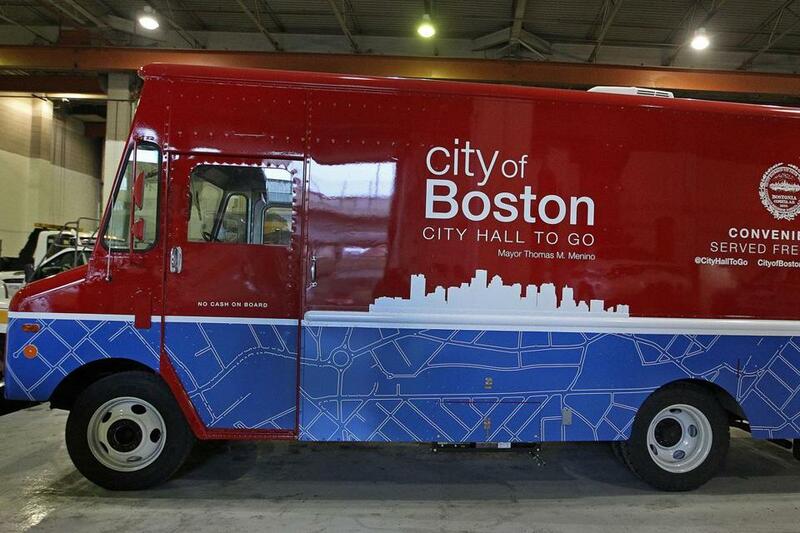 The van will debut Wednesday morning at City Hall Plaza before taking a promotional tour through the city, stopping at Boston Common, the Boston Public ­Library, Peters Park in the South End, and Howes Playground in Roxbury. It will also accompany the city’s holiday trolley tour this weekend. The van will be available ­periodically this winter to drum up awareness, before appearing in earnest next spring. City officials will survey residents to deter­mine the best times and locations and may offer evening and weekend hours as a convenience. “If you don’t work in the city, it’s tough to get to City Hall during the week,” said Molly ­Murphy, who works in the mayor’s office. In keeping with the food truck theme, the van offers a menu of services, including parking permits and recycling stickers. Residents can also ­report problems in their neighborhood and make suggestions and requests. Since most of those tasks can be handled online, the van will try to reach residents who are less Internet-savvy or who speak limited English and may need help navigating a process. The idea for the moving service sprang from meetings in City Hall this summer and was later proposed by several residents as a suggestion for The Mayors Challenge, a national competition designed to spur ideas to improve cities. Menino, known for his atten­tion to neighborhood concerns and quality-of-life issues, quickly lent his support. In a statement, Menino said the pilot program will show that “government can change” to become more flexible and convenient. “City Hall To Go builds on our mission to shake up the status quo in municipal services and offer a new way for Boston residents to get information and engage with the city on a whole host of services we offer,” he said. Once the city decided to create City Hall to Go, officials learned that a Police Department vehicle had just been taken out of commission and was available for the taking. Renovations were completed Monday, just in time for Wednesday’s debut. The van has a bright, eye-catching design that should ­attract attention, although people may be initially disappointed by the absence of food. Organizers said they are keeping plans flexible so they can quickly adjust to public demand.